Hanukkah, or Chanukah, also known as the Festival of Lights, is an eight-day Jewish holiday commemorating the rededication of the Holy Temple in Jerusalem, which took place in the year 165 BC after its desecration by foreign forces. Hanukkah is observed for eight nights, starting on the 25th day of Kislev according to the Hebrew calendar, which may occur at any time from late November to late December. 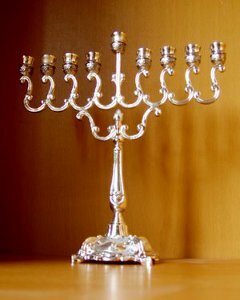 The festival is observed by the kindling of the lights of a very special candelabrum, the nine-branched Menorah, one additional light on each night of the holiday, progressing to eight on the final night. There are several songs associated with the festival of Hanukkah. The most well known in English-speaking countries include "I Have a Little Dreidel" and “Oh Chanukah”. In Israel, where Hanukkah has become something of a national holiday, “Sevivon” probably has the highest popularity. A large number of songs has been written on Hanukkah themes, perhaps more so than for any other Jewish holiday.